Warm and Dry, or Why I Don't Skimp on Work Wear! Lonesome Dove is probably the only mini-series I’ve watched all the way through (I’m not much of a television watcher – we’ve chosen not to watch broadcast or cable TV at home since our first child was born more than 16 years ago). While there a number of memorable lines in the series, the one that I recall most frequently is part of the eulogy that Gus gives when the character Deets dies – “He was cheerful in all weathers.” As a shepherd, I spend most of my days outdoors – in all weathers. I’ve found that my cheerfulness depends greatly on the quality of my work clothes. Since I’m writing this in mid-winter, I thought I’d focus on some of my favorite foul-weather gear. I'm also hoping that writing about "foul" weather will induce some to arrive - we're in the midst of a pretty serious drought (definite cause for lack of cheerfulness, in my opinion). Taking a bottoms-up approach, I’ll start with footwear. Well-oiled, well-made work boots, for me, are critical to my comfort. For factory-made boots, I prefer Redwing. I’ve also had good luck with custom-made work boots from Drew’s in Klamath Falls, Oregon (which I find more comfortable than Whites). When I’m working in hilly or rough country, I like lug-soled boots. On gentler terrain, I prefer a smoother sole that doesn’t track as much mud (and other stuff!) into the house. I like to keep my boots oiled with Obenauf’s Heavy Duty Leather Preservative – it keeps my boots soft and reasonably water proof. I always try to buy work boots that can be re-soled, too – new soles are much cheaper than new boots! In wet weather, I like neoprene boots – I’ve had Muck Boots and Bogs and like both brands. These are much warmer than regular rubber boots, which keeps my feet more comfortable. For most of my clothes, I definitely prefer natural fibers to synthetics. I wear wool socks year-round – the wool keeps my feet warmer and wicks away moisture better than any synthetic material I’ve found. SmartWool socks are great, but I’ve found that Wigwam socks wear just as well – and they’re made from US wool! I’ve recently learned about Darn Tough Vermont Socks and will have to try them – they’re about the same price as SmartWool socks but are guaranteed for life. When it’s cold enough for long johns, I also prefer wool and cotton. Duofold makes long underwear that are merino wool on the outside and cotton on the inside – very comfortable and quite warm. My wife likes Icebreakers – merino wool long johns made in New Zealand. I’ve also taken to wearing wool for intermediate layers when it’s cold. Older Pendleton shirts make great work shirts – I can’t afford to wear new ones for working in, but I’ve found used ones in thrift stores. Wool sweaters are great, too – wool can get wet and still retain body heat. My work jacket in dry weather is a Carhartt duck jacket with Sherpa lining. I wish Carhartt made a wool-lined coat, but this is a pretty good alternative. The heavy cotton duck fabric holds up to abuse, and I can throw it in the wash when it’s too dirty to wear (which happens frequently). In wet weather, I wear a Carhartt waterproof breathable jacket and rain pants. I prefer an unlined raincoat when I’m doing physical work, and the Carhartt breathes better than most while retaining its water repellency for multiple seasons. The fabric is abrasion-resistant, too. From my experience, Carhartt’s fabrics hold up better than those of other manufacturers. In very cold and/or windy weather, I’ll add a scarf. I’ve tried woolen scarves and mufflers and have found that they often get in my way. Now I prefer a silk scarf (Great Basin cowboys call them wild rags) – they’re soft around my neck, stay out of my way, and easy to adjust as the temperature changes. Since I don’t have much natural insulation atop my head (that is, I’m bald! ), I’m never outside without a hat. 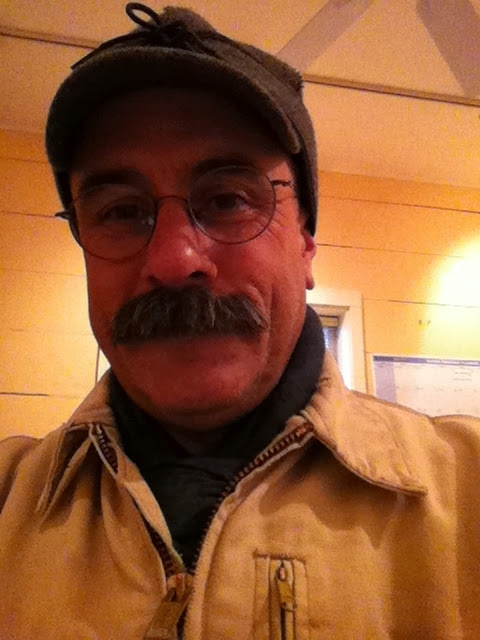 My favorite winter hat is a Stormy Kromer – a wool baseball cap with a unique slide-down ear flap for extra warmth. I like having a brim to shade my eyes, and the Stormy Kromer also comes with a lifetime guarantee. In extremely cold weather, I’ll resort to a hand-knit wool stocking cap that covers my ears entirely. I’ve started to think of my work clothes as part of the collection of tools necessary for doing my job. The clothes that I prefer aren’t the cheapest options out there – at least in terms of their initial purchase price. They do, however, last much longer than their cheaper alternatives. Clothes that can be repaired (like my boots) or replaced (like my hat) are sound investments. A comfortable (in other words, warm and dry) shepherd is one that can remain cheerful in all weathers! Ready to head out into last month's cold snap - and to remain cheerful!